The Boundary Gardens at the heart of the Boundary Estate in the London Borough of Tower Hamlets is a remarkable and historically significant place. The Boundary Estate was the first publicly funded social housing scheme built in the UK, formally opened in 1900, and now designated as a Conservation Area. The vision for the housing estate was originally designed around the circular gardens, raised on a tiered and planted mound with a bandstand as the central element. This was the first time that a social space, primarily for public arts and cultural events was seen as a fundamental part of, and central to the design of a social housing scheme. The Gardens are listed on English Heritage’s Register of Parks and Gardens of Special Historic Interest in England at Grade II. The Grade II listed bandstand, railings and overthrows were in such poor condition due to vandalism and decay, that they were listed on English Heritage’s Building at Risk Register (2007). The transformation of the space has been profound. 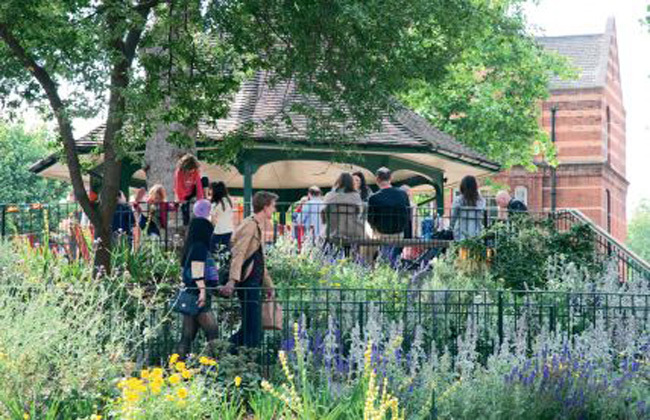 Arnold Circus now makes a real difference to the local community, improving the perception of an area that had a reputation of anti-social behaviour, and now attracting an increased number of visitors to its restored events space. The project highlights successful principles of landscape and urban design that have stood the test of time. Meticulous care was taken to retain original design intent; with the exception of the new planting, no elements were added that would conflict with original design. • A key cultural and architectural landmark which has particular significance to the local community. • Demonstrates how community groups can successfully lobby for improvements in their local environment, influence the space’s design and management process. structure of the Gardens to EH approval yet adding a contemporary layer through the planting design to meet community’s key requirement to improve biodiversity. • Planting comprises perennial flowers, grasses and ferns, providing cross seasonal colour. • Restoration carefully researched followed by meticulous workmanship to realise the restoration. • Community was fully engaged during all phases. This included public consultation, archaeological dig, use of time lapse photography during construction. • Restored gardens and bandstand have reconnected the community space now used for wide range of events: music, dancing, Carrom championship, cycling race, Arnold Day and the Sharing Picnic. • Beauty restored to a space once perceived as antisocial and unsafe, with the uniqueness of Owen Fleming’s original tiered ‘wedding cake’ design revealed. To restore the English Heritage registered grade II Gardens, with its Grade II listed bandstand and railings to become the focal point of the Boundary Estate community life, as it had been originally intended at the beginning of the 20th century. The listed bandstand was a high priority on the English Heritage Building at Risk Register (2007) and The Boundary Estate is widely acknowledged as a unique experiment in late 19th century social housing design and is designated as a Conservation Area by London Borough of Tower Hamlets. Works included restoration of the bandstand, fitted with power supply and lighting, restoration of railings and steps, resurfacing, new furniture and replanting. Works to the built elements aimed to restore the structures as close to their original form and finish as possible. • Modifications to historic railings, to incorporate seating and bins so as to reduce ‘clutter’. • New planting scheme to improve biodiversity. • Specialist conservation work to satisfy EH grant criteria. • Installation of water recycling system and underground storage reducing mains usage. • Community archaeology dig organized by Museum of London. A more contemporary approach was taken with the planting design developed in consultation with Friends of Arnold Circus. - To select plants suitable for both the shade and sun, and tolerant of water stress created by the mature London Plane trees. - To select nectar rich flowering plants with a long flowering season, to benefit biodiversity. - To bring colour and change with the seasons into the space. - To allow visibility into and out of the Gardens. - To create a good covering of plant material to suppress weeds and stabilize the soil with the root mass. - To plant species with seed heads which provide food for birds and visual interest during the winter months. 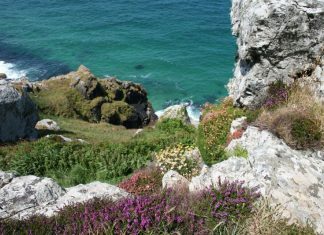 The public-space team, working with the Cornwall Area of Outstanding Natural Beauty Unit, recognised the need for Local Landscape Character Assessment (LLCA) to underpin NDP policies and piloted a methodology with the Roseland NDP through 2014.